When Icy9kills uploaded a picture of a frame spotted at their aunt's house to Reddit, they may have expected weird and wonderful visceral reactions were to come. 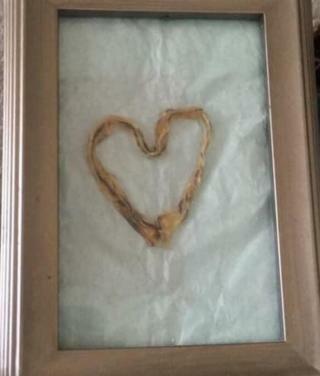 And with the title on the post being "My aunt framed my cousin's umbilical cord and shaped it as a heart", the other Redditers did not fail to show their shock and fascination with the artistic effort. In a pregnant woman, the umbilical cord joins the foetus to the placenta - the organ responsible for providing oxygen and nutrients, and removing waste substances. While traditionally it tends to be removed as a waste product after the birthing process, it appears as though umbilical cord art has a cult following among new mothers. Images are available for inspiration, observation and perturbation across all major social platforms. Indeed in 2017, The Saturdays singer and television presenter Rochelle Humes revealed she had turned her baby's umbilical cord into art. On Reddit though, the reaction was generally a negative one with user commenting: "Yeah I remember cleaning out some old wardrobes and we found my brother's umbilical cord. It literally crumbled like a coffee cake. It was absolutely foul." While AronJanet42 wrote: "My mom has my umbilical cord, hair from my first haircut and baby teeth. She even has the tooth I knocked out while drunk at 19. Not sure if it's for a clone or for voodoo but something's coming". A lot of the conversation then veered around placentas and preserving those, with even some querying about whether this was cannibalism. The general consensus on that though was a no, it is not. What can you do with an umbilical cord? "I did not tell a single soul except my then boyfriend - now husband - about the life growing inside me until my ninth month of pregnancy." Rachel remembered her mum fainting, her dad crying, her friends gossiping and she said everything just seemed to fall apart. However, she completed her university exams and said the whole process was a learning curve. "My boy is wonderfully made and I believe we are specially made for each other. He is a gift and the necklace is a constant reminder he has changed my life and the people surrounding me. "What better use of his body parts than to create something so beautiful out of this rather than it just staying in a baby book forever leaving it to disintegrate?